Google released the Android 4.3 officially. And its available for your development. The developers in team CyanogenMod is definitely trying to port their builts for the devices. 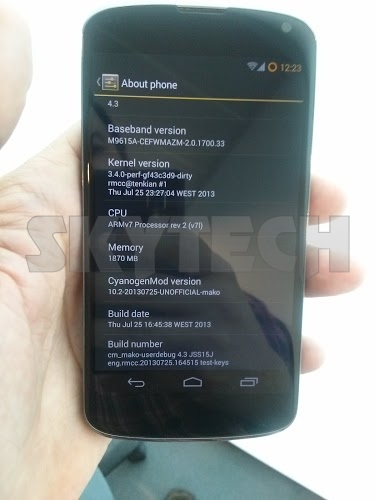 And to taste the CyanogenMod 10.2 nightlies Google Nexus 4 is first in the que. One of the developer managed to bootup his Nexus 4. The port is unofficial and we can expect except a nightly very soon. With CM 10.2 we can also except the NEMESIS the cool camera app in upcoming CyanogenMod roms. 4.3 Status Update #2 – Builds that boot So much excitement this morning! Marching towards getting the code ready for mass consumption, +Ricardo Cerqueira’s Nexus 4 got the CM 10.2 treatment (yellow theme and all). You’ll notice that the build version reads “UNOFFICIAL” meaning this was done on his home PC. We still have to iron out some issues on a device by device basis, but we are now one step closer to enabling the CM 10.2 nightlies.